At Design a Sign we are industry-leading experts for the production of high quality signs, banners and posters for all your business and commercial printing needs. Whether you are looking for high quality glass-effect acrylic signs for your office, professional brushed-aluminium plaques to go outside your high street shop, or PVC roller banners that stand out from the crowd for your next exhibition, Design a Sign are dedicated to providing exceptional signage products at very competitive prices. 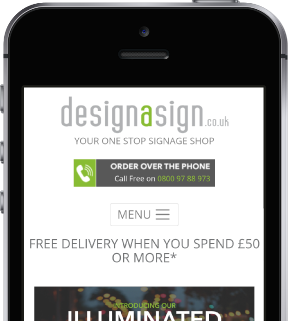 To help our customers find and order the product they want, we’ve produced this ecommerce website, where you are able to swiftly order personalised PVC banners, roller banners, shop signage, window vinyls and many more high-quality printed products. We truly are a one-stop signage shop. Should you have any questions about our service, please do get in touch with us via 0800 97 88 973 or info@designasign.co.uk. Should you already have your perfect artwork ready and pre-designed, you can upload it straight away, then order your product, sit back and wait for delivery. We recommend that all artwork provided is 300dpi in quality to ensure a perfect reproduction. Alternatively, you can take advantage of our free design service for signs, posters and prints. Simply select this option on the product page. Please get in touch with our design team free on 0800 97 88 973 if you’d like to find out more. Should you be interested in using our free design service, don’t worry about forgetting to send us your design brief; we’ll be in contact if we don’t hear from you after 24 hours. We only use the highest-quality materials for our signs and banners, so you can rest assured that you will always receive an excellent product from us. We are certain you’ll be happy with our service and all of our signs carry a 12 month warranty, just in case. All of our signs and banners come ready-made with fixings and fittings included. Browse our website for examples of the best-selling signs, banners and other products that we produce day to day for our clients. If you’ve got a sign in mind, but it’s a little bit out of the ordinary, get in touch with our production team free on 0800 97 88 973 or info@designasign.co.uk we’re always up for a new challenge! We offer a price matching service on a like for like basis, should you find the same product with the same spec as one of ours (same materials, print quality, etc.) for a cheaper price somewhere else. Once you’ve purchased our product for its sale price, and sent us proof of the competitor price you have found, we can then refund the difference to you. Please read our Terms & Conditions for full details.